Delicate Boundaries, a work by Chris Surgue uses human touch to dissolve the barrier of the computer screen. Using the body as a means of exchange, the system explores the subtle boundaries that exist between foreign systems and what it might mean to cross them. 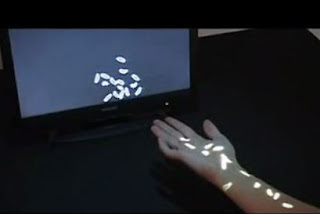 Lifelike digital animations swarm out of their virtual confinement onto the skin of a hand or arm when it makes contact with a computer screen creating an imaginative world where our bodies are a landscape for digital life to explore.